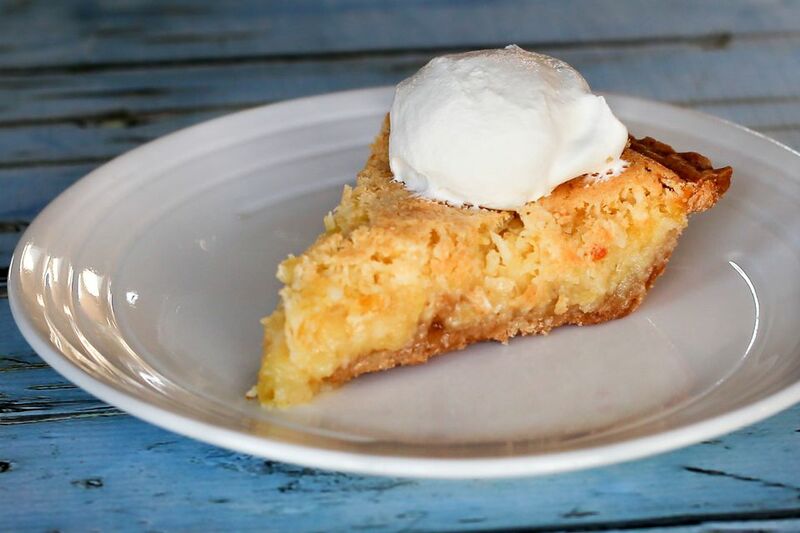 This pineapple chess pie is a wonderful combination of the tropical flavors of coconut and pineapple. We made the pie with a frozen crust (see the picture) and our family loved it! Use a regular or gluten-free crust for this pie. The recipe makes enough filling for a homemade deep dish pie. If you use a standard 9-inch frozen pie crust, you might have some excess filling. You could put the extra in a buttered ramekin and bake the small custard along with the pie. We usually par-bake the pie crust for a custard type of pie to avoid a soggy bottom, but that's optional. Follow the directions on your pie pastry or frozen crust for partially baking, or see the directions below the recipe. The flavors of pineapple and coconut stand out in this delicious pie, and your family will request it again and again. Make two and take one along to a potluck! Prepare the pie crust and fit it into a 9-inch pie plate. Crimp as desired. Place the crust on a baking sheet. Line the crust with foil and fill with pie weights (at least two-thirds full). Transfer the pie (on the baking sheet) to the oven and bake for 10 minutes. Carefully remove the pie weights and return it to the oven for another 3 to 4 minutes, or until it just begins to color. Remove the pie from the oven and reduce the oven temperature to 325 F (165 C/Gas 3). Combine the remaining ingredients and blend thoroughly with a whisk or electric mixer. Bake at 350 for 35 to 45 minutes, until set. The center will jiggle slightly when done. If the crust edge is becoming too brown cover it with a pie shield or make a foil pie ring to prevent excessive browning. Cool the pie completely on a rack and then chill in the refrigerator before serving. Serve with a dollop of whipped cream or whipped topping, if desired. To partially bake a homemade pie crust, heat the oven to 425 F. Line the pie plate with the crust and flute the edges as desired. Line the pie shell with foil or a sheet of parchment paper. Add weights, such as pie weights, beans, or rice. You should add enough weights so the bottom and sides are held down. This keeps air pockets from bubbling up. Bake for about 12 minutes, or until you see the crust beginning to show color. Remove the paper or foil with the weights; return the pie crust to the oven and bake it for about 5 minutes longer. The bottom should look dry.. Remove the pie crust from the oven and reduce the oven temperature for 400 F.
Fill the pie shell and bake following the recipe.